While looking for Italian restaurants in the east side of Melbourne, I came across Il Birrificio. Located on Toorak Road in Camberwell, its far away from the hustle and bustle around Camberwell Station as this little gem is actually quite close to Burwood. 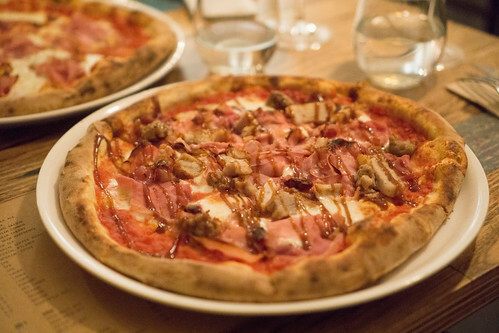 What Ill Birrificio does well is its Wood Fire pizzas but their pastas, starters and desserts aren’t neglected either. 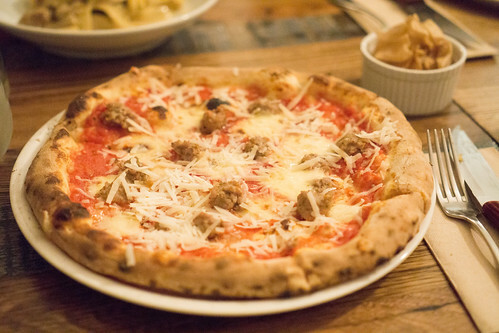 Their Salsiccia & Scamorza pizza was very tasty. I loved the cheesy topping with the meat and the fresh tomato base on a thin, crisp crust. 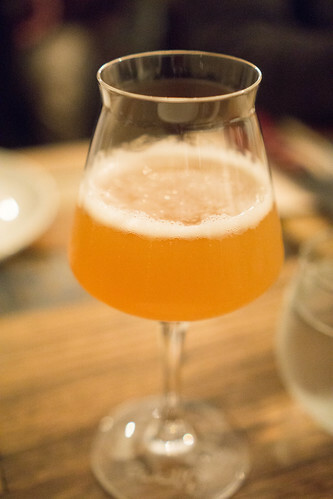 Il Birrificio has a few specials, on the night we dined they had the Fettuccine Gamberi which has this zingy lemon taste to it, with the fresh thyme flavour coming through. 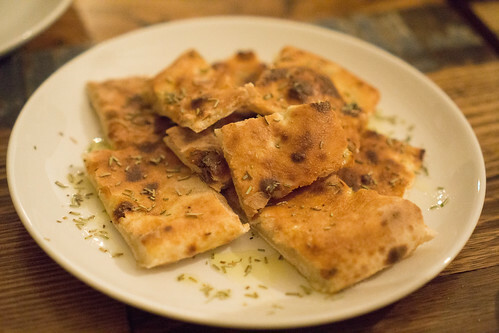 While an Antipasti board isn’t what I would typically order, the cold meats with the rosemary and sea salt focaccia made for a pretty good starter. I am not certain if they always have the Grapefruit beer on offer, but I do recommend trying it if you have not had something like this before. I loved the grapefruit flavour, and while the combination might be a bit odd on first looks it’s actually one of my favourite fruity beers. The Biramisu is another winner from Il Birrificio. The beer flavour comes through well, and it’s not too rich or sweet. 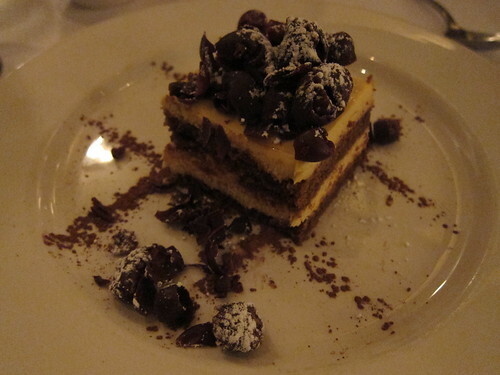 A great twist on the classic tiramisu. 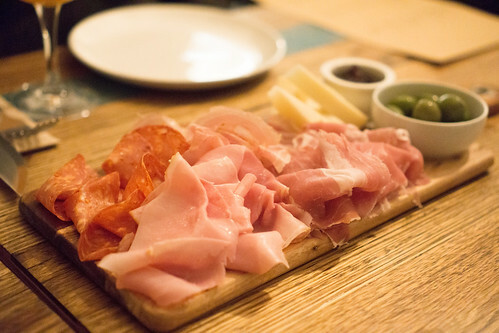 This hidden gem has fantastic Italian dishes on offer in a very chilled environment. Café Buade was our first meal in Quebec City, after arriving by train from Montreal. Already lunch time, the Old Quebec City was packed full of people and tourists (like me! ), we finally found a restaurant that looked quaint and food that was reasonably priced. Service here was great actually, and even though they do speak in French initially (of course), they do respond in English without much hesitation. Probably because it’s a tourist hotspot, but it puts us at ease nonetheless. The food here has a mix of Italian, French and your burgers, steaks and grills. 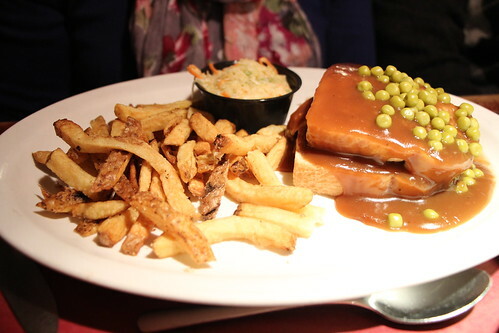 We ordered one of their grills, which comes with coleslaw, fries and topped with a BBQ gravy and peas. The gravy was quite bland on first impressions, and it was in dire need of pepper. The fries were also a tad on the dry side of things, although super crispy as you can see. Overall, I found it to be a very average dish. 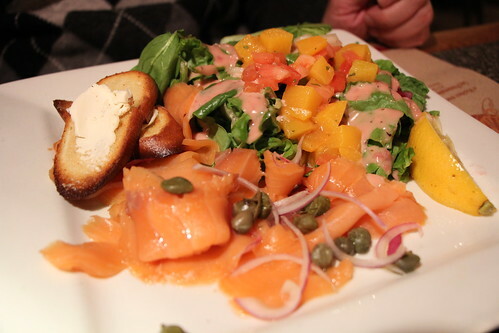 Their Salmon salad is quite fresh , with their salmon, capers and onions with a dressing. Not particularly my type of dish but it’s not bad if you like salmon and capers. 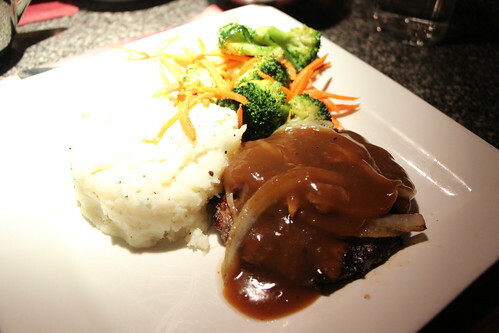 Their Hamburger steak, served with sautéed onions, vegetables and your choice of a side and sauce (I chose mash and gravy) was a decent meal. Hamburger patty moist but the mash potato was lacking in pepper, creaminess and smoothness you would often find in a good mash. It doesn’t leave a lasting impression but it does fill you up. Overall, our dining experience at Café Buade can be summed up with just a few words. Very average. From our meals, I couldn’t think of any highlights or anything that stood out in anyway, other than that you’d get a decent feed here. If you’re here for a limited time, like we were, I’d probably suggest finding another restaurant to dine at. Gelato Messina in Fitzroy is another popular Ice Cream and Gelato shop in Melbourne. Originally from Sydney, they have opened their doors down in Melbourne in outer rim of Melbourne’s CBD. 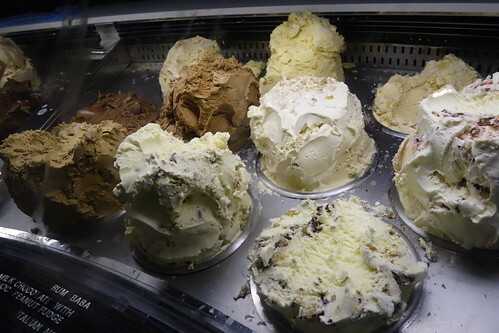 What attracts people here is of course their interesting selection of ice creams but having a great depth of flavour as well. One of my highlights was their Lychee and Coconut gelato. The Lychee flavour is fruity, flavourful and not artificial like you’re eating Lychee essence. The dessicated coconut that weaves through the ice cream, gives it added texture and complements the Lychee well. Tastes fresh, rich and yet not overwhelming with sweetness as some ice creams would be. 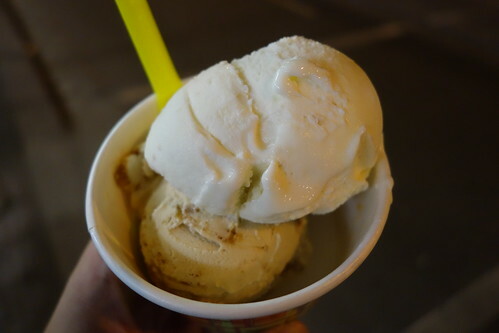 Their Hazelnut ice cream is similar to most other gelato stores such as Il Dolce. I would have preferred a bit more nuttiness with chopped hazelnuts, but the flavour of it was quite good. The interesting other flavour was their Yoghurt & Berry which I’ve never had previously, with poached raspberry and blueberry coulee. The actual ice cream is more milder in flavour but with the berries which bring the sweetness and a tad of tartness, it does make for a great combination. Dulce De Leche – an Argentinean caramel made by reducing milk until it becomes a sweet jam. Tiramisu (G)(A)(E) – egg, marsala and mascarpone gelato with lady finger biscuits soaked in espresso coffee. 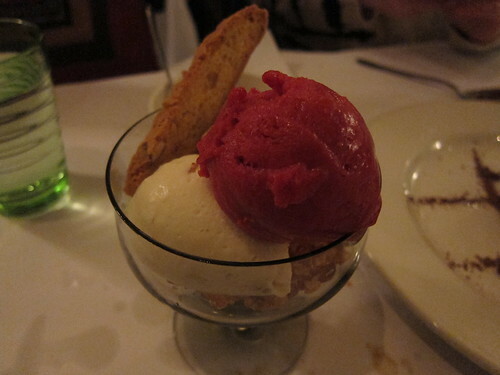 Pannacotta with Fig Jam and Amaretti Biscuit (G)(N)(E)(A-traces) – pannacotta gelato base. Pandan & Coconut – Pandan is a green asian leaf used in asian cooking. 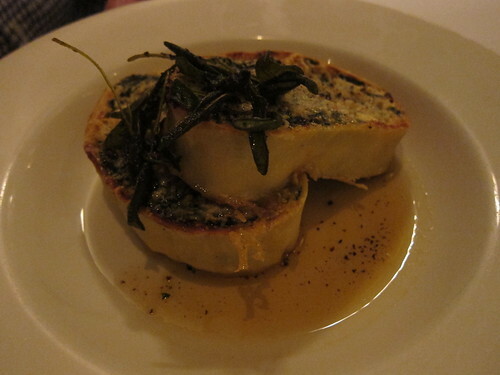 They have a plenitude of flavours to choose from, and in addition to their specials that change regularly. I’d definitely recommend giving it a try when you’re out about in Melbourne, or in Sydney for that matter. Once you do give it a try, you can see why it remains popular to this day. With queues even during the evening. During the last couple of months, my home grown parsley grew wild and unattended (oops). It almost looked like a small tree with a very thick and stern trunk/stem. 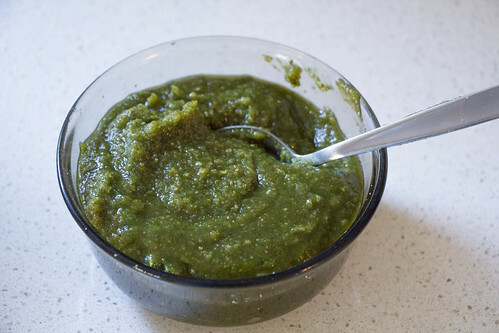 Having an exorbitant amount of parsley I searched for recipes that used parsley in excess, which was really why I was growing parsley in the first place but never gotten around to cooking anything with it. Luckily, I found this seemingly quick and easy fresh vegetarian pasta recipe from Foodandwine.com which looked fantastic and turned out quite well too if I do say so myself. Check it out below! 1. Preheat the oven to 350°. Toast the walnuts in a pie plate for 7 minutes, or until golden; let cool. Coarsely chop 1/4 cup of walnuts and transfer to a bowl; add the 2 tablespoons of chopped parsley and half of the grated Parmesan. 2. In a large pot of boiling salted water, cook the pasta until al dente; drain. 3. In a mini food processor, pulse the remaining 1/2 cup of walnuts with the 1/4 cup of parsley leaves and the garlic until finely chopped. Add the remaining grated Parmesan cheese and the olive oil and process to a coarse purée. Season the pesto with salt and pepper. 4. Return the pasta to the pot. Add the vegetable stock and butter and simmer until the liquid is nearly absorbed, 1 to 2 minutes. Off the heat, add the pesto and toss until combined. 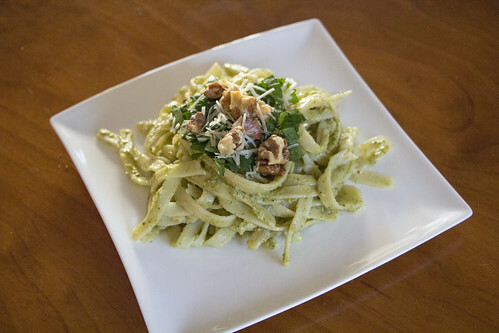 Transfer the pasta to a bowl, garnish with the walnut, parsley and Parmesan topping and Parmesan shavings and serve. 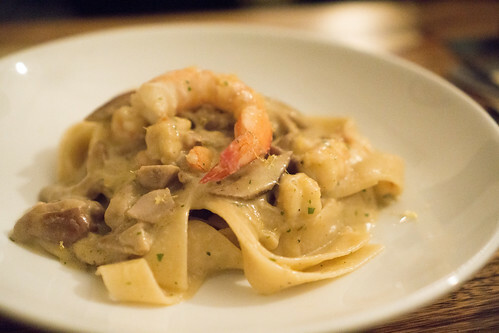 My only downfall with this dish was my failure of pouring in all the dry fettuccine into boiling water all at once. This resulted in clumping of the noodles and uneven cooking as some became thick strands (undercooked) and others cooked past al dente. Flavour wise, it was pretty tasty for a dish that has minimal ingredients, the parsley pesto was extremely flavourful and a bit of a zing. As this dish has no meat, I’d actually prefer more walnuts to be added (maybe 1 cup) instead as I also added one whole bag full of fettuccine (probably too much actually). Other than that, I found this recipe to be one I’d be keen to try again. 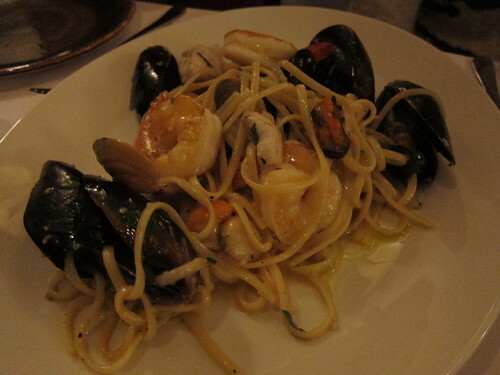 Before coming to Italy 1 on Bourke Road, Camberwell, I checked out the reviews for it on Urbanspoon and it was very mixed. Having that in mind, my overall experience with Italy 1 is good, it definitely is on the upper scale of your dining experience ($$$) but I found the food here to be mostly fantastic bar a few. 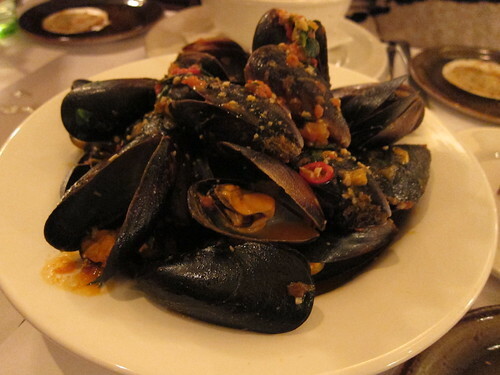 As an entree we ordered the Mussels it is cooked with a tomato sugo and seasoned with garlic and tomatoes (mainly). The staff mentioned the mussels here are of a higher quality and so that’s why the mussels are tinier than in most places. The mussels were indeed lovely and fresh and I really couldn’t get enough of the slightly salty, spicy tomato sauce that is flavoured with mussels. 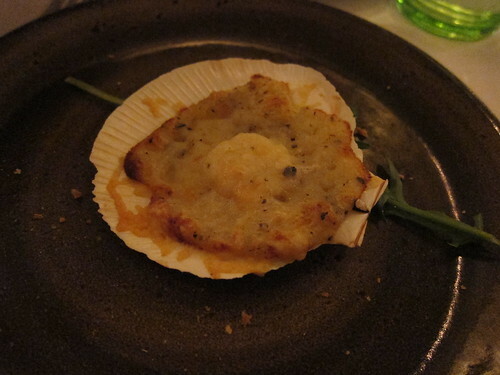 Italy 1’s Baked Scallops were a bit of a downer, the scallops were tiny comparatively to the shell it comes in with the cheesy crust on top being mostly too crusty to gel well with the soft scallop. The scallop was very tasty I must admit but for the price, I don’t believe it’s worth it. Onto the mains, the Roast Duck with greens was fantastic. 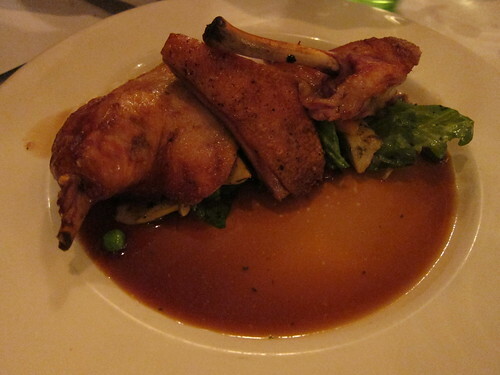 The duck was perfectly cooked, and melts in your mouth with all the juices. The sauce that accompanies it, is interesting. I couldn’t quite put my finger on the ingredients sued but it went well with the duck and salad. 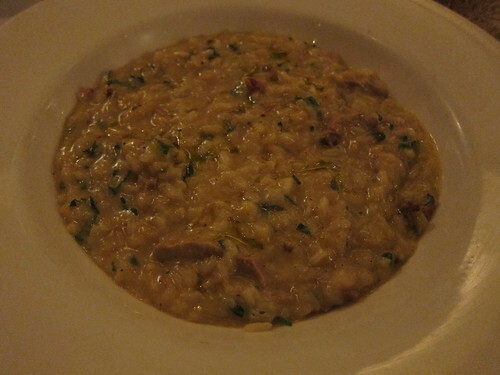 The Duck Ragu with Sage and Pancetta Risotto wasn’t too great to be honest. Overly salty, either from the cheese or duck and slightly under seasoned. It lacked any real distinct flavours but the duck was very tender which is a plus along with the risotto itself cooked al dente. The Linguine Marinara with mussels, clams, prawns, scallops, fish and seasoned with chilli, parsley and garlic was another winner at Italy 1. The linguine was cooked perfectly (there wasn’t enough!) but I guess the centre pieces of the dish are the seafood so that’s understandable. Seafood overall were fresh and tasty and seasoned well. Really lovely. For dessert we ordered Tiramisu. Very light but creamy and chocolatey, and with just enough liqueur to keep it moist. Distinct and defined layers. 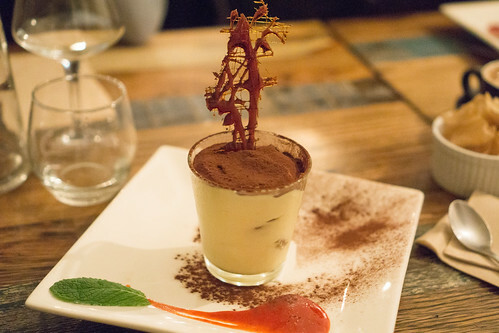 I do prefer Tiramisu to be slightly chilled and although it was served room temperature, it was delicious. The goat’s milk on first taste was slightly odd because I’ve never tried an ice cream that was just milk but after my initial shock I really enjoyed it. It was milky (of course) and creamy and not too sweet. Probably the best of the three actually. As mentioned in my opening paragraph, some of the dishes weren’t as good as others but overall I found it to be a very satisfying experience and the staff here are lovely too. Great food, nice ambience on a Saturday night. Price might be an issue for some but it’s good for a night out once in a while.